Wideband audio for PC-based IP telephony means the 6.8 kHz frequency range of the Jabra GN9300e Series is more than twice that of conventional telephony! High-definition sound of this caliber gives you the feeling of a true "face-to-face" conversation and lets you get more done more easily because you hear every detail the first time. Intuitive and easy to use, the Jabra GN9350e offers a choice of wearing styles with softer earpiece materials, and features a sophisticated LCD display on the base unit, letting you set personal call parameters such as volume and audio output. 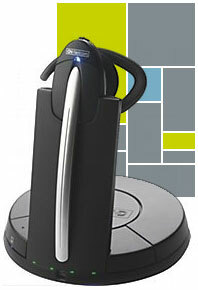 A wireless range of up to 350 feet plus conference-call capability gives you added communications potential. And you can keep an optional second battery charged in the base and even hot-swap it to give you around-the-clock talk time. The Jabra GN9330e USB is also available in a special version optimized for Microsoft Office Communicator 2007. 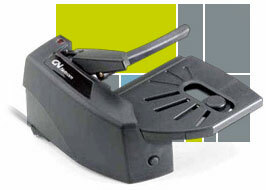 The GN1000 Remote Handset Lifter is the perfect accessory for your GN Netcom wireless headset system. With the GN 1000, you can answer and end calls from wherever your wireless headset takes you. It’s easy to install, and its one-button operation means ease of use. The GN 1000 senses the magnetic field the speaker generates when your phone rings, which means you'll never miss a call or be signaled when there isn’t a call. Its solid mechanical lifting components won’t let you down either. It’s compatible with and works with virtually all business telephones.